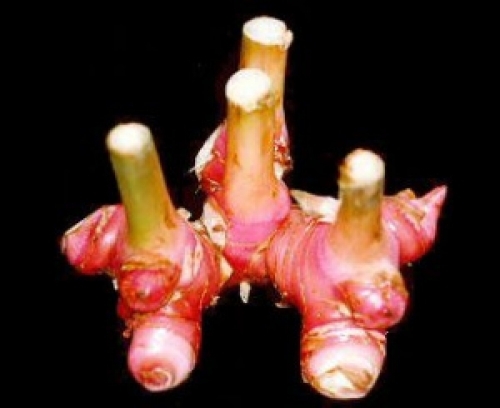 The rhizome is a common ingredient in Thai and Indonesian cooking, particularly curries and soups. The plant grows from rhizomes in clumps of stiff stalks up to 2m in height with abundant long leaves which bear red fruit. It is a semi- dormant plant in Winter i.e looses some leaves. It is drought intolerant, as it prefers moist soil. Prefers shade to full sun position. Frost sensitive. The rhizome is aphrodisiac, carminative, tonic, diuretic, expectorant and disinfectant, and has been traditionally used to treat range of conditions including skin infections such as eczema and ringworm, poor appetite, bronchitis, heart disease, headache, lumbago, rheumatism, sore throat, chest pain and more. The species has also been reported to have psychoactive effects including active as a stimulant and mild psychedelic. Dormant in Winter. Can be shipped as a bare-rooted rhizome.